Top urban waterfront planning and development work of 2004 is featured in an illustrated booklet produced by the Waterfront Center. Containing 109 four-color photos, maps and diagrams, as well as capsule descriptions of each award-winning project and plan in a high-quality paperbound booklet is available for $10 (plus $2 for postage). The 20-page booklet features the winners of the Waterfront Center's annual Excellence on the Waterfront competition, a program begun in 1987 with assistance from the National Endowment for the Arts. The Top Honors for 2004 went to the Mill City Museum and Minneapolis Riverfront District in a joint award. Top Honors in planning went to the Eastshore State Park and Oakland Waterfront Trail plans along San Francisco Bay, also a joint award. Ten additional works were recognized, including two plans, seven projects ranging from parks to residential developments, and one award to a grassroots initiative in what the Center terms its Clearwater Award. The winners were selected from 73 entries. Heading the 2004 jury was Alex Lifschutz, director Lifschutz Davidson Ltd., London, England. Other jurors were from Berkeley, Calif.; Littleton, Colo.; Toronto, Ontario, Canada,, and Columbia, S.C. with backgrounds including civic activism, engineering, greenway planning and landscape architecture. 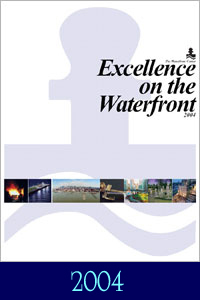 The deadline for the next Excellence on the Waterfront awards program is July 1, 2005. The 2005 Jury Chair is George Stockton, president of Moriyama and Teshima, Toronto, Ontario, Canada. Details about entering will appear on this Web site. The winners of the Waterfront Center's 18th annual "Excellence on the Waterfront" awards program will be announced at the Center's annual conference at the Pfister Hotel, Milwaukee, Wisc., by jury chairman Alex Lifschutz, director, Lifschutz Davidson, London U.K. Serving on the 2004 jury were Michael Dawson, director, The River Alliance, Columbia, S.C.; Sylvia McLaughlin, Waterfront Action, Berkeley, Calif.; Robert Searns, project development consultant, Littleton, Colo., and George Stockton, president, Moriyama & Teshima Planners, Toronto, Ontario, Canada. The 12 awards are listed below by category. Joint Award to Mill City Museum and Minneapolis Riverfront District, Minneapolis, Minnesota. Submitted by Thomas A Meyer, principal, Meyer, Scherer & Rockcastle, Ltd., Minneapolis, and Nina Archbal, director, Minnesota Historical Society, Saint Paul, (for Mill City Museum); Charles T. Lutz, deputy director, City of Minneapolis Department of Community Planning and Economic Development, and Jon Gurban, interim superintendent, Minneapolis Park and Recreation Board (Riverfront District), Minneapolis, all Minnesota. Joint Award to Oakland Waterfront Trail, Bay Trail Feasibility and Design Guidelines, Oakland, and Eastshore State Park General Plan, San Francisco Bay, both California. Submitted by Kerry Jo Ricketts-Ferris, City of Oakland, and Jacinta McCann, EDAW Inc., San Francisco (for Oakland); Stephen Hammond, Wallace Roberts & Todd, LLC; Ruth Coleman, acting director, California Dept. of Parks and Recreation, Sacramento; Pat O'Brien, general manager, East Bay Regional Park District, Oakland, and Brenda Buxton, project manager, California Coastal Conservancy, Oakland, (for Eastshore), all California. National Anpin Harbor Historic Park, Tainan City, Taiwan, Republic of China. Submitted by the Tain-Tsair Hsu, Tainan City Government and Prof. Ming-Hung Wang, Department of Architecture, National Cheng-Kung University, Tainan, Taiwan, R.O.C. Ashbridge Bay Treatment Plant Site Design, Toronto, Ontario, Canada. Submitted by Mark Rupke, Water and Wastewater Division, City of Toronto, and Mary McIntyre, architectsAlliance (note: lower case "a" correct) and Diana Gerrard landscape Architecture. Northwest Maritime Center "Demonstration Dock," Port Townsend, Washington. Submitted by Dave Robison, executive director, Northwest Maritime Center, Port Townsend, Wash., and Craig Curtis, principal, Miller/Hull Partnership, architects, Seattle, Wash. The San Francisco Ferry Building, San Francisco, California. Submitted by John Long, SMWM, and Byron Rhett, Port of San Francisco, both San Francisco, California. Submitted by John Vetter, Vetter Denk Architects, and Michael Wisniewski, Dept. of City Development, both Milwaukee, Wisconsin. Millennium Park Recreation Core, Kent County, Michigan. Submitted by Roger Sabine, parks director, Kent County Parks Department, Grand Rapids, and Eric Lyons, president, O'Boyle, Cowell, Blalock & Associates, Kalamazoo, both Michigan. Corvallis Riverfront Commemorative Park, Corvallis, Oregon. Submitted by Michael W. Zilis, Walker Macy Landscape Architects, Portland, and Jon Nelson, city manager, City of Corvallis, both Oregon. Hudson River Park, New York City, New York. Submitted by Connie Fishman, president, Hudson River Park Trust, and Han-Padrom Associates, LLP, both New York, New York. False Creek North/Concord Pacific Place -- Beach, Roundhouse and Quayside Neighborhoods, Vancouver, British Columbia, Canada. Submitted by Larry Beasley, co-director of planning, City of Vancouver, and David Negrin, Concord Pacific Group Inc. both Vancouver, British Columbia, Canada. Named for the citizen's group working on the cleanup of the Hudson River in New York, this award is for grassroots citizen's initiatives or other public interest actions. Penn's Landing Forums, Philadelphia, Pennsylvania. Nominated by Harris M. Steinberg, executive director, Penn Praxis, School of Design, University of Pennsylvania. Photos may not be copied by any means without permission of The Waterfront Center and must give photo credit.